Marshall is an area second to none in its offering to the sports enthusiast including tennis, bowling and golf, as well as fishing, hunting, camping, and watersports at nearby Caddo Lake and Lake O’ the Pines - two of the best fishing and recreational lakes in Texas. Annual events include Josey’s World Championship Junior Barrel Race and Stagecoach Days in May, Tennessee Walking Horse Show in July, the FireAnt Festival in October, and the Wonderland of Lights Christmas Festival Thanksgiving thru New Years. The city was founded in 1841 when Peter Whetstone offered Harrison County Commissioners land for a courthouse, a church and a school if they would only locate on his land in the middle of the county. Whetstone's offer was accepted, and by 1842 Marshall was the county seat. Civic leader Isaac Van Zandt named the town in honor of United States Supreme Court Justice John Marshall. Marshall, the first town in Texas with a telegraph, providing a connection with New Orleans, thereby had one of the most important newspapers in antibellum Texas, The Texas Republican , published by fire-eating Robert Lowery. By 1860 it was one of the wealthiest, largest towns in Texas, home of the first - Edward Clark - and last - Pendleton Murrah - Confederate governors of the state. 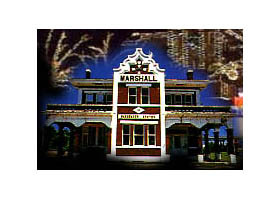 Marshall was headquarters for much of the Trans Mississippi Department of the Confederate States of America, as well as the Confederate Capital of Missouri, adding a seventh flag to the six others that flew over the Lone Star State. Jay Gould brought the Texas and Pacific Railroad to Marshall in 1871 - lured by the promise of land and $300,000 from the coffers of the county. For a time, the T.&P. shops provided one out of every four jobs in town. Because Marshall also became a cotton-shipping center for East Texas, even more jobs were dependent on the rails. It was during the railroad era that many of the large homes and successful mercantile business were established. The town was and remains an educational center, beginning with Wiley College in 1873, Bishop College in 1881- which later moved to Dallas, the College of Marshall (now East Texas Baptist University) in 1914, and Texas State Technical College in 1993. As the cotton and railroad jobs disappeared, they were replaced by jobs in small manufacturing - particularly in the pottery industry. One pottery in 1848 has expanded to a dozen, including the Untied States' largest manufacturer of red clay pots. They are a major attraction for the growing tourist industry. Visit Marshall Computer Connection on Facebook for their current specials and offers! Visit Marshall Computer Connection's website. Visit one of our sponsors: Expert Roofing & Construction, LLC.